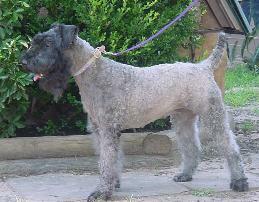 Search and adopt a Kerry Blue Terrier near you. Kerry Blue Terriers are strong-headed and highly spirited. They have always been loyal and affectionate towards their owners and very gentle towards children but were often considered downright mean toward other animals including other dogs. The Kerry just isn't everybody's dog, he's too smart for that. If you don't understand him or don't accept him as one of the family, then he just doesn't turn on that personality for which he is famous.